At 31 weeks, I’m sleeping less now. Either the babe wakes me because of movement or because of the movement I’m more aware of my need to pee, I get woken up and stay awake. Thankfully, I’m able to nap at will, so I’ve been making good use of our lovely leather love seat during the day. I’ve started also having pain in my hips when I wake up. They tell me this is normal. 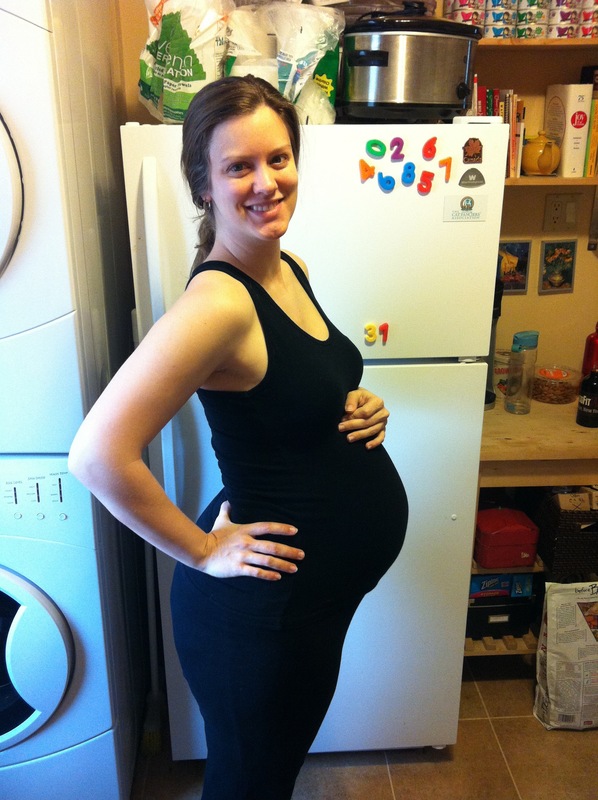 At 31 weeks, I’m still eating liverwurst, braunschweiger, grass-fed nitrate-free beef hot dogs, grass-fed ground beef, compassionately-raised pork, sustainable and low-mercury fish, antibiotic-free chicken, and the occasional compassionately-raised duck. As far as veggies go, I’m trying to follow the Whole 9 seasonal veggie guidelines. I include limited rice, corn and potato in my diet when I’m super hungry. I’m starting to have way less room for food and really becoming convinced that I have low stomach acid – something for which I am grateful during my pregnancy, but will seek to address after I’ve delivered the babe. 500m row => 2:12 PR! Re the rowing PR… I wish I knew why this keeps happening. 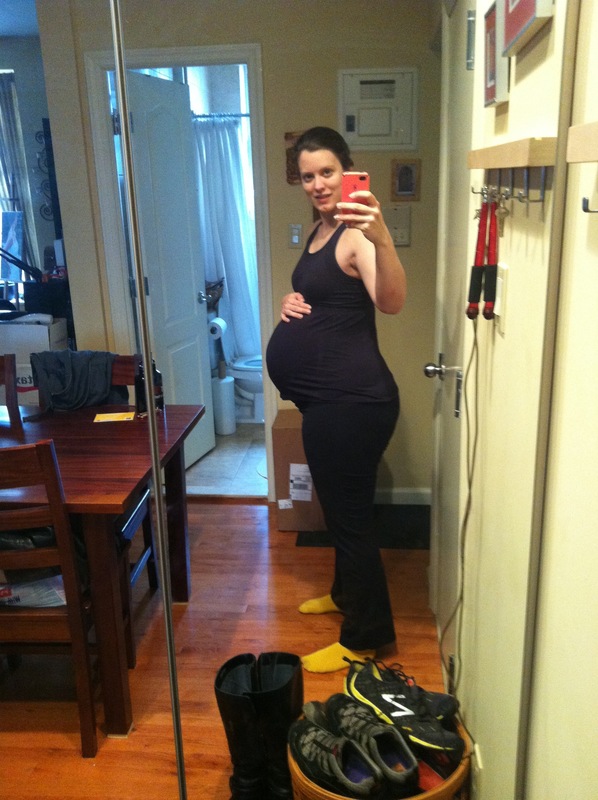 Perhaps being pregnant is just good for rowing? Will my times go back up after April? We shall see… Regardless. Happy for the PR. Re the Met Con… I still think 1 strict pull-up is hardly a fair replacement for a rope climb. I’m willing to do 3-5 reg pull-ups or ring rows as a replacement. But as they say in Newfoundland, “What odds!” I did four rounds with strict plate presses until Coach Tami reminded me it was supposed to be push presses. Oops! The 1000m row is much more exhausting than 500m, but still felt doable. I had to pace myself but I don’t think my form broke down. The dead-lifts were fine. Coach Jacinto tried to get me to have a narrower stance, but then he took a look at my belly and realized that I couldn’t. My feet have to be a bit wider for the dead-lifts for the time being. I was working off a 1RM of 185#. Gilliebean at 31 Weeks Preggie! At 30 weeks, back aches in my lower back are getting common now. Especially in the morning. My boobies are getting tender again (to be expected?). I’m feeling hungrier these days and more fatigued. BabyCenter tells me that my babe is about 16″ and 3.3 lbs. That’s pretty long and skinny! I guess s/he is about to put on a bunch of cute and squishy baby fat! Consequently, I feel less like I can easily carry this uterus/baby and more like it’s a weight upon my bladder. FWIW, vaginal discharge is pretty much the same. I keep getting woken up in the middle of the night by the tiny human that lives inside me. Party for one at 3 am! At 30 weeks, I’m starting to wonder if the antigens / antibodies that my body creates in response to my food allergies are going to passed along to my babe in the breast milk. I asked my ND in California what he thought and he said that it’s unlikely. The babe is more likely to develop food allergies genetically (so there’s nothing I can do now!). However, I’m still skeptical. Consequently, I’ve been thinking that I need to be *really* strict in these last few weeks with avoidance of my food allergy triggers so I can phase out my antigens/antibodies so they don’t show up in my breast milk – at least until my babe’s gut lining has closed (around the 6 month mark). This would include all gluten grains, eggs, all milk and a few spices and veggies. Do any of my readers have any thoughts on this? Today I stayed home and did a kettle bell workout. Then I did 5 x 15-second hold pelvic tilts (aka angry cats aka cat-cows). Used 25#. These are fun. Do you know what they are? I didn’t. Basically you take a step forward, alternating legs, with each up swing on the odd rounds. And then you take a step back on the even rounds. Used 18#. This is a weird one. You do a back lunge with the right leg and pass the KB under your left leg to the left hand. And back. Then repeat with the opposite leg. I couldn’t get the pass-thru the legs thing because of my belly. So I stuck to doing lunges and alternating the KB in front of me. No photo this week. I’m sorry! Next week I’ll be sure to have a photo. I promise! You are currently browsing the Club Fritch blog archives for February, 2012.